Sold by NEWLIFEE and ships from Amazon Fulfillment. 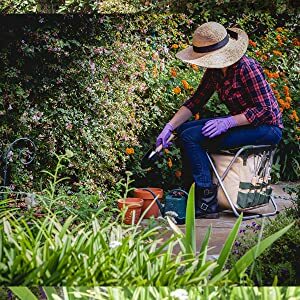 Some regard gardening as a spiritual endeavor, with healing properties for the soul. 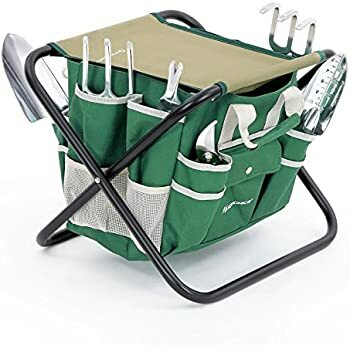 The Gardener Folding Seat with Tools makes it easier to garden, putting your gardening tools within easy reach on a comfy, portable seat. 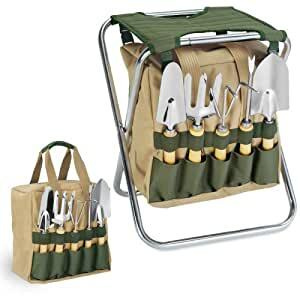 One summer day, you may need all five of its essential tools which include 1 each: 12.13 inch broad trowel, 12 inch narrow trowel, 11 inch fork, 11 inch cultivator/rake, and 12.5 inch weeder, all made of durable steel with wooden handles. 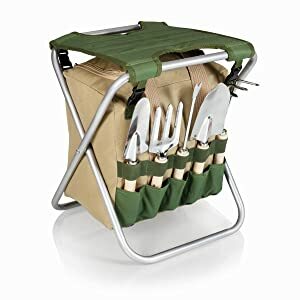 You might thank the universe for a kit that includes a gardening stool so close to Mother Earth. 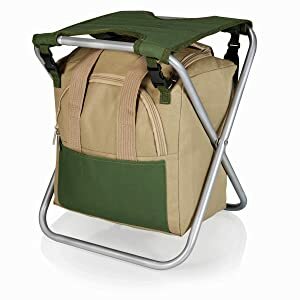 Then again, you might just reach beneath the stool into the detachable polyester storage tote for your phone and snacks instead. When we started our business back in 1982, we wanted to inspire people to spend quality time with family and friends. After 36 years in business, we’ve reinvigorated that mission with the launch of Picnic Time Family of Brands. 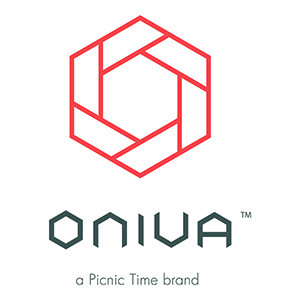 The ONIVA brand encompasses active living and outdoor recreation. 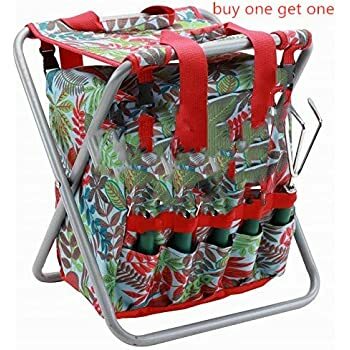 This line offers a wide array of outdoor gear such as chairs and stadium seats, food totes, cooler and travel cases, gardening totes and kits, beach essentials, and so much more. We have good news for gardeners! 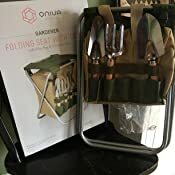 Your job just got easier with the Gardener 5-piece garden tool tote set by ONIVA - a Picnic Time brand. 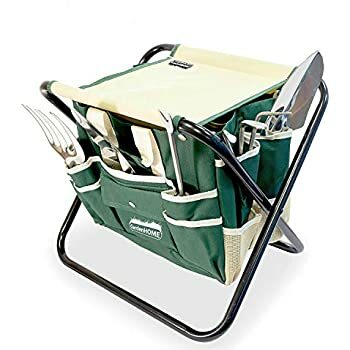 Save your knees and back with the Gardener that features a lightweight folding seat and detachable polyester storage tote all-in-one. The tote has two zippered openings, one on the backside and one on the top, for easy access from any angle and it conveniently holds the five metal garden tools on the exterior of the tote so they are readily accessible when you need them. 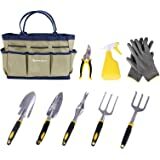 All five tools have wooden handles and handy wrist straps. 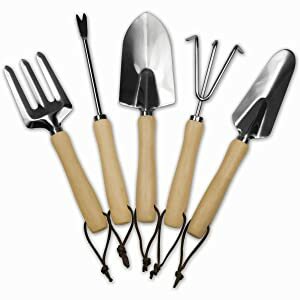 Makes a perfect gift for those who are passionate about gardening. Measures open 15-1/2 by 13-1/2 by 12 inches. We believe that our products should be strong, reliable, and work the way they were intended. That's why we are proud to offer the BUILT TO LAST Lifetime replacement pledge. If for any reason our product fails to perform as promised, Picnic Time Family of Brands will repair or replace your item without hassle- FOR LIFE. 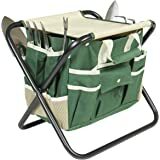 Folding chair with five gardening tools; Detachable storage tote. 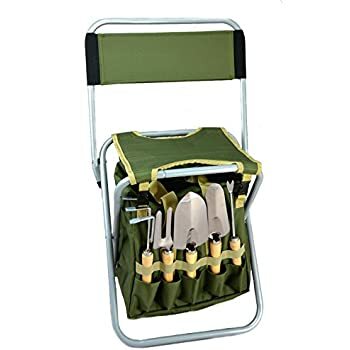 Steel tools with wooden handles; Seat made of polyester canvas. Returned this item the day it arrived. 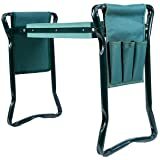 It was a gift for my husband who is 6'3" tall (weighs 212 lbs) who loves gardening in the back yard. 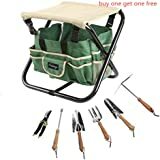 He opened the box and put everything together but when he went to sit on the "sturdy steel frame" the seat collapsed and he was almost impaled by the weeder. The quality of the tools leave a lot be desired. They're flimsy and he went back to his old ones because he didn't want to bend/break these. Not worth the money and definitely a safety hazard. I think I'll go to the local nursery and see what I'm buying. Don't waste your money. Bought this for my wife for Christmas. They only good thing that came out of this was the bag that holds everything. The handles broke on the tools the first time i used them do to what looked like pre existing cracks. The stool is flimsy and would probably hold up, but not worth the money. Doing basic weeding of the yard, all the hand tools broke. Don’t spend your money on these tools. Sadly this tool set turned out to be very cheaply made and overall poor quality. 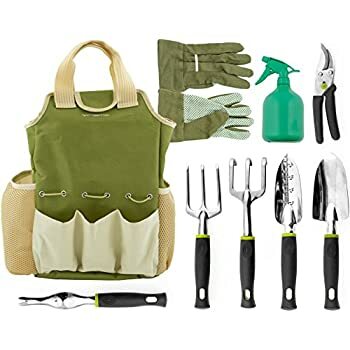 Overall I was very disappointed considering half the tools didn't survive their first weekend of spring gardening usage. I broke the spade handle upon first use and bent another spade soon after. Unfortunately this was a christmas gift so I discovered this after return period had ended. You are better off spending a little more on tools that are sturdier. 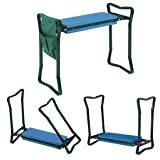 this set was given as a gift and the person did not like it as the seat is very uncomfortable to sit on. She gave it back to me and now since 30 days past I cannot return it as the return window has expired. How do I return this gift ?? Cheap cheap cheap! 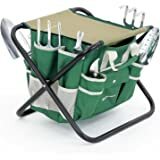 buy this for the stool, not the tools. 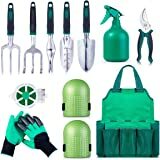 The tools are not going to last through your first gardening day. They are very cheap thin stamped steel. My mom loved this as a Mother's Day gift....until, she sat on it and fell through the canvas! All four side tore. My mom maybe weighs 130lbs. It was right out of the box new. Selves it and hoping that one sneaked through quality control. We are replacing it. We will see how number 2 goes. :(. Glad my mother was not hurt badly. I love the theory behind this seat. Unfortunately, as I move back and forth while planting, the cloth starts to slide down the poles. I have to constantly readjust. 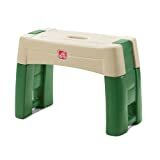 Also, carrying it as a stool is awkward since all the tools are on one side making that side lean down. Just bad weight disbursement. A couple small tweaks would make this a great product since the canvas, frame, and tools are all good quality. 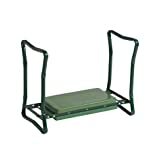 a good sturdy gardening stool — Dee L.